NEW YORK, April 13, 2019 – CJ Albertson turned in a world-record performance on Saturday to win the Columbia University Irving Medical Center & NewYork-Presbyterian Indoor Marathon World Record Challenge presented by New York Road Runners at The Armory’s New Balance Track & Field Center. 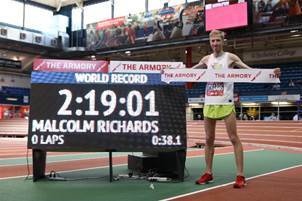 It’s the fourth consecutive year the men’s indoor marathon world record was broken at The Armory in Washington Heights. 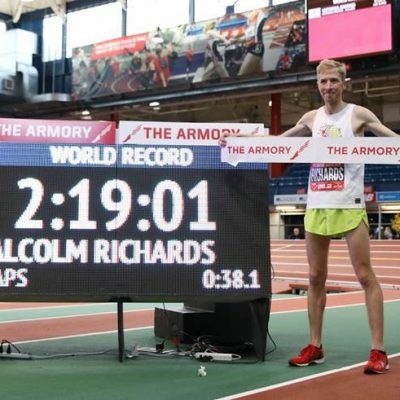 Albertson, Richards and Great Britain Olympian Andrew Lemoncello (2:20:04.5) ran together for a majority of the 211 laps around The Armory’s 200m track. But Albertson made his move with 20 laps to go and maintained the lead the rest of the way. His final 200-meter lap was a sizzling 30.8 seconds. “My strategy was to stay with everybody for as long as I could,” said Albertson, a 2020 Olympic Trials qualifier. 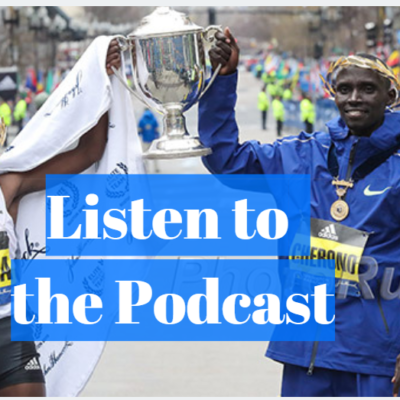 “At some point you think about being aggressive and taking the lead. I didn’t want to take the lead until I thought I could for sure win. 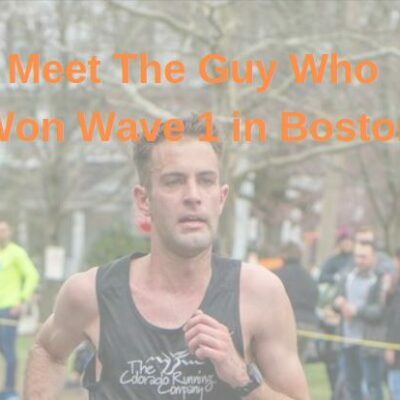 “I was planning on holding off for another mile, but I hit a patch where I started to feel better. I could tell the leader Malcom was tiring a little bit and our pace was slowing up. We were within 2 ½ miles and I felt like I could go ahead and finish. Stephanie Pezzullo, a 36-year-old triathlete trainer in Ocala, Fla., was chasing Lindsey Scherf’s 2:40:55 indoor marathon world record for most of the day. But with less than 10 laps to go Pezzullo was slowed down by a cramp in her left calf en route to winning the women’s indoor marathon with a time of 2:42:11.3. “I was on a cruise three weeks ago and my training has been a little spotty the last few weeks,” Pezzullo said. “I said I was going to go out there and give it my all, sacrifice my body and that’s what I did. Chelsey Albertson, wife of CJ Albertson, was the women’s runner-up with 2:54:26.5 time in her marathon debut. 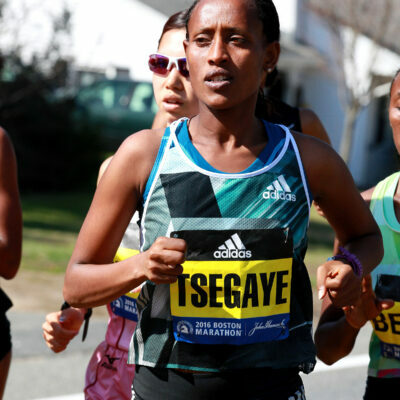 “It definitely helped me having her in the race and I hope it helped her,” her husband said. 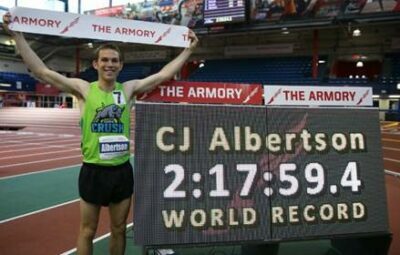 Both CJ Albertson and Pezzullo received the winner’s share of $3,000 and Albertson also earned $4,000 bonus for breaking the world record. Richards won $2,000 for being runner-up and a $1,000 bonus for breaking his previous mark. “(CJ) made a pretty decisive move and it wasn’t long before he put a pretty good gap on me,” said Richards, the 36-year-old schoolteacher from San Francisco. “At that point I kind of conceded a little bit and decided to fight for second (place) and still go under the previous record. That was the goal at that point. The team relay portion of the event is taking place all weekend and allows groups of up to eight co-workers, friends or family members to tackle the distance as a group, making this race accessible to all. There are 102 teams entered this week to compete in the relay portion. 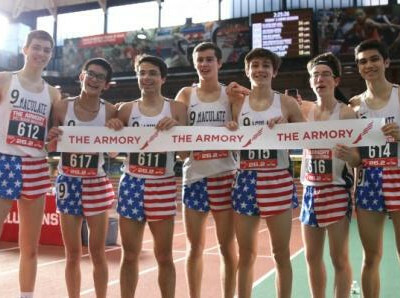 Proceeds from the event benefit the non-profit Armory Foundation and Armory College Prep, which sends nearly 100 percent of its New York City high school students to four-year colleges and universities. 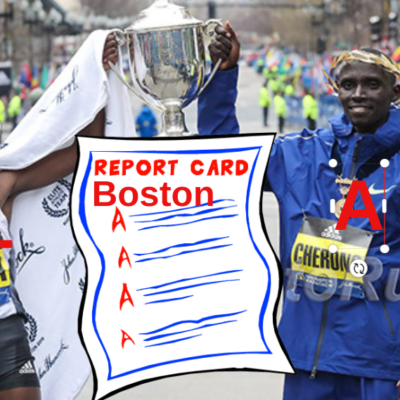 Talk about the race on the LetsRun.com Messageaboard. MB: 2:17:59.4 New INDOOR MARATHON WR! !